This article is about the tier II light tank. For one of the other Pz.Kpfw. II variants, see Pz.Kpfw. II (disambiguation). The Pz.Kpfw. II is a German tier 2 light tank. The last modification of the light Pz. II tank. 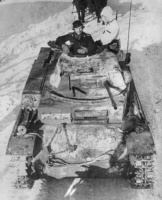 The vehicle featured enhanced armor, the 2 cm KwK 38 gun and improved observation devices. A total of 524 vehicles were built from March 1941 through December 1942. 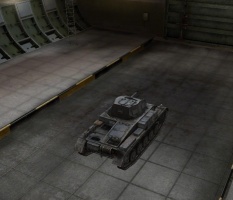 This tank combines good speed with excellent maneuverability, and boasts 30mm of armor on the front hull and turret. It's one of the few tanks in the game that can only use auto-cannons. Its 2 cm Flak 38 L/112 auto-cannon can penetrate nearly every other vehicle at its tier or below, and well-aimed shots can penetrate most tier 3 tanks. 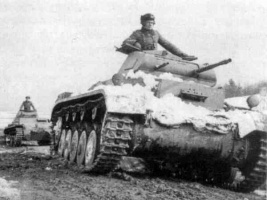 As with most tanks of its tier, the Pz.Kpfw. 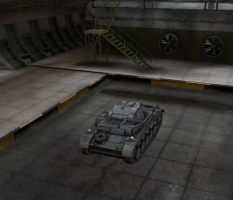 II is easily upgradable and it's a tank that is a lot of fun to fight in, especially as the player's skills improve. 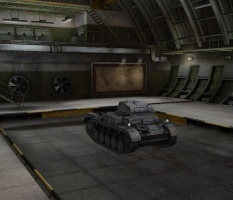 A popular vehicle, you will doubtlessly face this tank many times on the battlefield. The Pz.Kpfw. 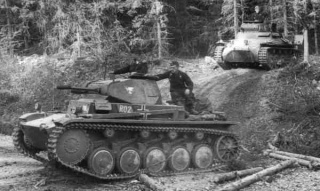 II leads to the Pz.Kpfw. III Ausf. E, and the Pz.Kpfw. II Ausf. G.
Highest penetrating auto-cannon available at this tier, also rather accurate and with short aiming time and reload time. Excellent view range and radio range. Acceptable armour against other auto-cannon guns, angling this tank correctly allows several bounces. Good speed with excellent maneuverability. Low penetration at long range; unable to hit targets beyond 395m. Tier III tanks and H35s can gives you a hard time with your autocannon. 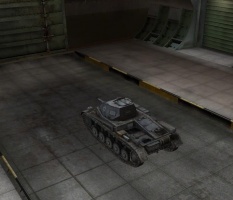 Weak turret armor which causes problems if attempting to go hull down with this tank. This is a fun fighting tank. If you were using the Breda on the Leichttraktor then you should find this tank very similar. It can be very effective in urban environments or anywhere it can engage in short-range combat. At long range the auto-cannon is far less effective, as it has to re-aim after every two-shot burst. It carries a good amount of ammo though, so you can afford to utilize some "spray and pray" tactics. Due to this tactic coupled with its good aim time, an Enhanced Gun Laying Drive is a little useless. You should try to avoid Hotchkiss H35s unless you want to use premium shells (except if you know its weak spots). The Panzer II's frontal armour is above average and can easily deflect many shots from rivals that are using auto-cannons. This tank is great fun when fighting up close. Its high RoF coupled with decent pen means it can go food (or tank)processor on other puny tier 2s. Well-aimed shots can pen nearly anything for same-tiered tanks. Although it may have somewhat sluggish speed, it's still enough to keep up with the pace of the battle. Your good armor (30 mm) can bounce quite a few shots when angled correctly. Try to avoid sniping; the autocannon's pen greatly diminishes over distance, and your accuracy is bad as well. Also, avoid French tanks such as the Hotchkiss H35 or the D1 as their armor is more reliable against your gun. The T18 is also a liability, but good flanking skills can overcome it with relative ease. Shooting the T18 in the front upper glacis plate will however ensure penetration and in turn cause most early players to back off due to sudden penetration from the front of the supposedly impenetrable front of a T18, giving you sufficient time to run or possibly even shoot the sides of a retreating T18. Allow M2 Light Tanks and M3 Stuarts to pass by you and shoot their rear or sides , as their weak spots in front cant be reliably penetrated due to their high speed. Overall, this tank is very well-rounded. You don't need the added weight capacity from the suspension upgrade on this tank, but it adds 5 deg/s to traverse speed, so it's definitely worth getting. With 120 RPM and 11 damage, you can do over 1,200 DPM, which is astoundingly high for tier 2. First research the 2 cm KwK 38 L/55 for faster rate of fire, aim time, and accuracy. You may want to continue on and get the 2 cm Flak 38 L/112, which features much improved penetration and accuracy. Next it's a toss-up between the engines and the suspension. Note that the turret upgrade also improves the reload time, in addition to increasing view range and hit points. In July of 1934, the Waffenamt (Ordnance Department) ordered the development of an armored vehicle ten tons in weight and armed with a 20mm automatic cannon. In early 1935, a number of manufacturers, including Krupp AG, MAN (chassis only), Henschel und Sohn AG (chassis only), and Daimler-Benz AG provided their prototypes of the Landwirtschaftlicher Schlepper 100 (LaS 100) - agricultural tractor - for evaluation by the army. The new vehicle was also known as the 2cm MG Panzerwagen and as VK 622 (Versuchkraftfahrzeug 622). The new light tank, Panzerkampfwagen II, was to supplement new Panzerkampfwagen I light tanks as a vehicle with heavier armament capable of firing armor-piercing and high explosive rounds. Krupp was the first to present their design, but it was not adopted. It was then decided to utilize the chassis designed by MAN and hull by Daimler-Benz. 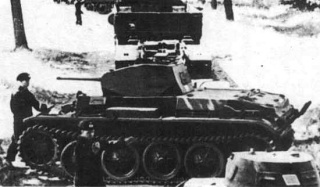 In October of 1935, the first soft steel prototype was tested and ten LaS 100 tanks, later designated as Ausf a1s, were ordered. From late 1935 to May 1936, MAN produced ten Ausf a1 tanks. The Panzerkampfwagen II (Sd.Kfz.121) was larger than the Panzerkampfwagen I, but was still a light training tank. 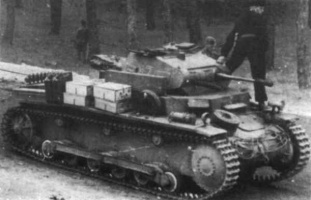 Due to the delays in production of the Panzerkampfwagen III and Panzerkampfwagen IV, the Panzer II entered combat service as a "stop-gap" vehicle for the expanding Panzertruppen. Similarly to the Panzerkampfwagen I, it did not prove very effective in combat, although it was the main battle tank of the Panzertruppen until 1940 and 1941. Overall, the Panzerkampfwagen II was ineffective as a combat tank but was an important step in the development of more powerful panzers. 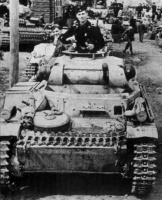 When put in good hands, the Panzer II was a good light tank and an effective light reconnaissance vehicle that provided German designers and manufacturers with more tank building experience. As with any other panzer, its chassis became a base for the usual conversions, including the Marder II tank destroyer, Wespe self-propelled howitzers, and others. Additionally, other designs utilized the same components: the Flammpanzer II Flamingo/PzKpfw II(F) flamethrower tanks, the Schwimmpanzer II amphibious tank, and the Sturmpanzer II Bison self-propelled gun. There are no historical records of a Panzer II armed with the 2 cm Flak 38. This page was last modified on 26 February 2019, at 15:45. This page has been accessed 291,346 times.